Are you ready for another fabulous kit? We've got an AMAZING birthday kit for you this month. The Make a Wish card kit is sure to become a well used favourite! The new Make a Wish Card Kit will be available on Tuesday, June 21 at 10:00pm EDT. I stamped the candles in Blu Raspberry, Cherry Crisp, Cornflower, Green Room, Lemon Drop, Persimmon, and Purple Rain Premium Dye Ink. The flames were stamped in Lemon Drop and Persimmon Dye Ink. The sentiment is from the Make a Wish stamp set, I stamped it on a sentiment strip from the Blueprints 29 Die-namics. The Make a Wish Card Kit will be available on Tuesday, June 21 at 10:00pm EDT. Yay, lots of candles, love this kit. What a fun birthday card to receive. Very cute card! I love the stamp set. So many beautiful candles a terrific card make! Love the Hot Stuff!! Great colors and patterns on the candles. 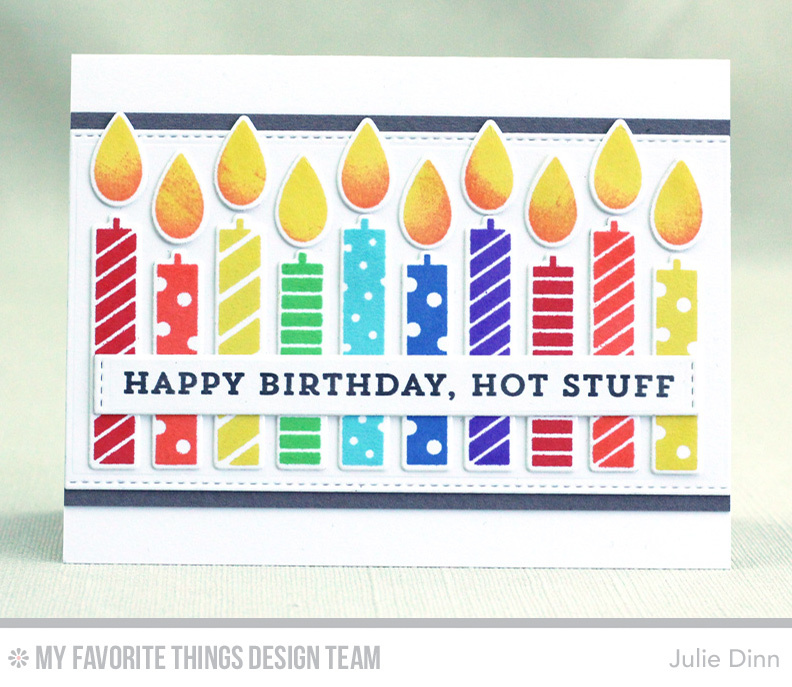 Such a fun card Julie, love the long row of candles! You have to chuckle when you read the sentiment! Will bring a smile with all those candles😁. I would love giving his card to my hubby. This is very good. Love the multitude of candles and the variant flames! Love it. Just love the colors.